In, March, we announced that FiG was in the process of revamping the Amazing Moves Denver website design. The site was launched in April. As a moving company in Denver, Amazing Moves faces a few business challenges. 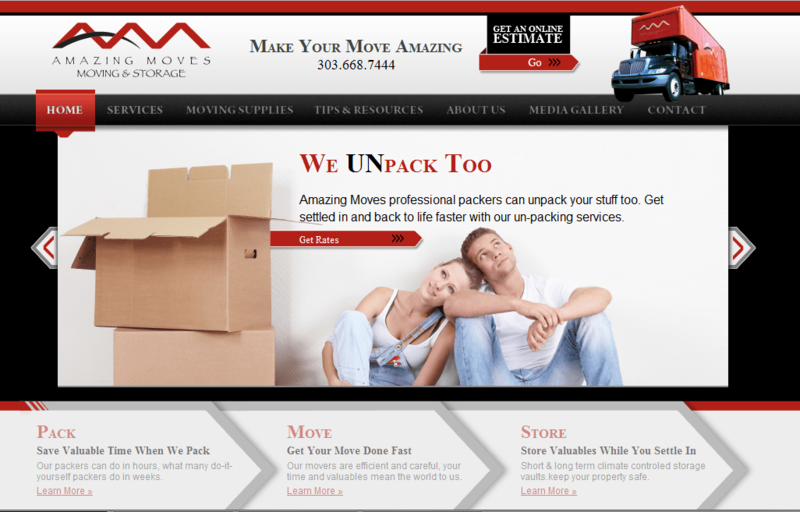 First, there are a lot of competitors in the moving industry and Amazing Moves must differentiate themselves. Second, repeat customers are infrequent as people do not usually move often. The U.S. Census Bureau says the average American moves 12 times throughout their entire life. With an average American lifespan of 78.74 years, that's a move every 6 and a half years. High competition and fewer repeat customers mean that Amazing Moves must earn business from competitors and earn referrals from clients. The original Denver website design created by FiG for Amazing Moves had high conversion rates but was ready for a facelift. FiG redesigned Amazing Moves' website to reflect the modern, cutting-edge moving technology that the company offers and differentiate its value proposition from competitors. We continued the pay-per-click advertising (PPC) and social media campaigns to drive traffic to the site and as a result, the Amazing Moves traffic and conversion rates have improved over the already positive numbers we achieved over the last six years. When comparing the website being active these past three months to the previous three months, we see that conversion rates have already increased 21.58%. The website has increased in the number of sessions by 29.43% as well as the new website users by 28.50%. You will see in the graphs below the sessions from May-July 2016, compared to February-April 2016. These are the Sessions and Conversions comparisons from this May-July period to the previous, Feb.-April period. FiG is thrilled to see the success in Amazing Moves newly designed website has achieved within three short months since launching. Are visitors not spending time on your site or not contacting you as a result of their visit? It could be time for a website update. Contact FiG today to gain more traffic and more conversions from your site.